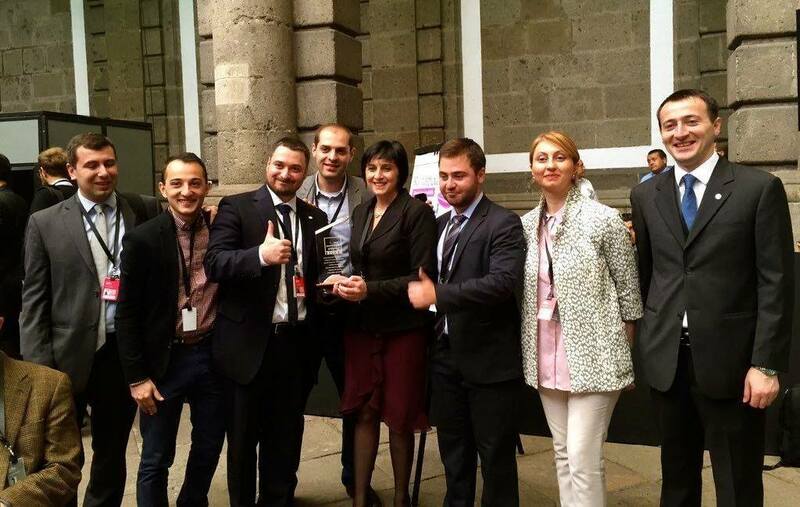 On October 27th, Georgia was awarded with the OGP Government Champions Award at the OGP (Open Government Partnership) Civil Society Day in Mexico City, Mexico, that was held within the OGP Global Summit Mexico 2015. It was the first time the Open Government Partnership team announced the OGP Government Champions Award. The Award is intended to showcase the ideal co-creation dynamic between the government and civil society while elaborating the National Action Plan; to provide a high-level political visibility to the key actors who have played an immense role in upholding the OGP commitments and award the team that shared responsibility, authority and co-created the Action Plan, successfully managed safeguarding the voice of civil society actors in the National Action Plan development process and embraced the recommendations from civil society regardless political sensitivity of initiatives and difficulty for the government. Institute for Development of Freedom of Information (IDFI) had nominated the Inter-Factional Working Group of the Parliament of Georgia since the Institute believes, Inter-Factional Group, consisting of 11 Members of Parliament from majority and minority factions, has made an active input in the process of elaboration of the Action Plan and putting forward the commitments, which the Parliament is supposed to implement in the years of 2015-2016. Three semi-finalists (Georgia, Costa Rica and Sierra Leone) were selected by the Award selection committee and an award winner was determined by a public vote. 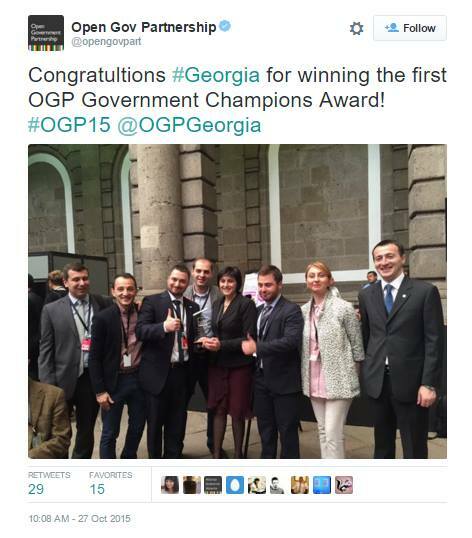 Thus, Georgia became a winner of the OGP Government Awards from 66 OGP participating countries. The Chairman of the Parliament of Georgia, David Usupashvili mentioned in his address to the Parliament that on October 28th, on the date which marks 25 years since Georgia held its first multi-party elections, the country has become famous in Mexico by winning the first OGP Champions Award. The Open Government Partnership Global Summit Mexico 2015 is an annual event and is expected to gather around 1,500 participants - including representatives from civil society organizations, businesses and governments. Among the attendees are the representatives of the IDFI: Director - Giorgi Kldiashvili, Chairman - Levan Avalishvili and Project Coordinator - David Maisuradze. Moreover, with the support of the UNDP and the EU, the IDFI ensured the attendance of the MP - Tamar Kordzaia and the Head of Public Relations and Information Department - Nino Beradze, at the OGP Global Summit. Ketevan Tsanava and Zurab Sanikidze from the Analytical Department of the Ministry of Justice of Georgia and Giorgi Oniani, Deputy Executive Director of the Transparency International – Georgia are also attending the event. The OGP initiative which is a multilateral initiative intends to provide a platform for domestic reformers to make their governments more responsive, accountable and transparent to their citizens. Georgia joined the Partnership in 2011 and since December, 2014, IDFI has been implementing the project 'Supporting Involvement of the Parliament of Georgia in Open Government Partnership Initiative'. The Project is funded in the framework of the EU and the Parliament of Georgia Program: “Strengthening the System of Parliamentary Democracy in Georgia Project Document” which is implemented by the United Nations Development Programme (UNDP). 'Supporting Involvement of the Parliament of Georgia in Open Government Partnership Initiative' aims to promote parliamentary openness and transparency, increase citizen engagement into the legislative processes through the involvement of Parliament in the OGP.